Stephen Bedford introduced guest speakers. Debbi Sexsmith, an Urban Indigenous Homeward Bound program coordinator at the Niagara Region Native Centre. This program addresses needs and challenges of homeless, Indigenous, single mothers living in poverty in seven of Ontario's Friendship Centre communities. As the charitable arm of Rotary, we tap into a global network of Rotarians who invest their time, money, and expertise into our six areas of focus (https://www.rotary.org/en/our-causes). The Foundation has invested $3.95 billion in programs, projects, and scholarships. It has a best in class, 4 star-rating from Charity Navigator and invests 91% of its revenue in programs. Past District Governor/Past President Dave Haddow shared the Club's experience in being awarded three $25,000 Foundation Scholarships for local students to pursue post graduate degrees at international universities. President Elect John Boot described how the Foundation's Global Grants helped fund three major water and sanitation projects that the Club led, the most recent being a $160,000 project in Marsabit, Kenya. 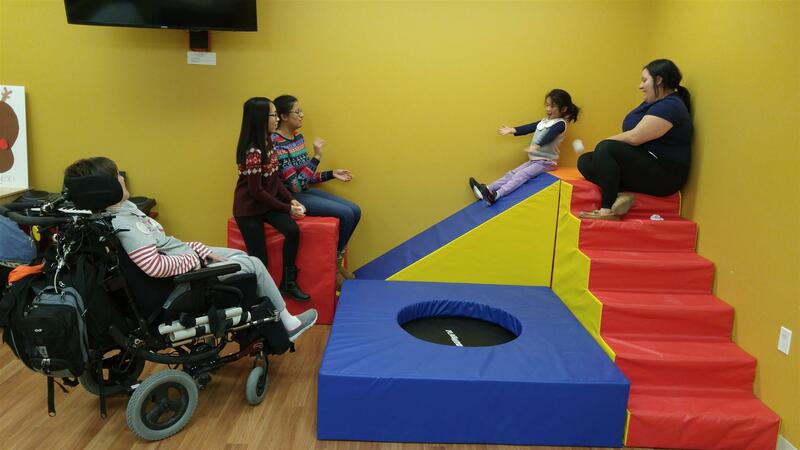 The NOTL Club has also been awarded annual Foundation grants for many years to support projects that the Club has championed, the most recent being the sensory room at Red Roof Retreat. Ms. Rima Boles, Director of the Niagara Pumphouse Art Center provided an overview of how NPAC is interested in making Summer Art Camps accessible to those who can't attend due to financial restrictions. NPAC is celebrating their 25th anniversary and they wish to celebrate this milestone by offering day art camps to disadvantaged children as a means to encourage budding artists through learning. 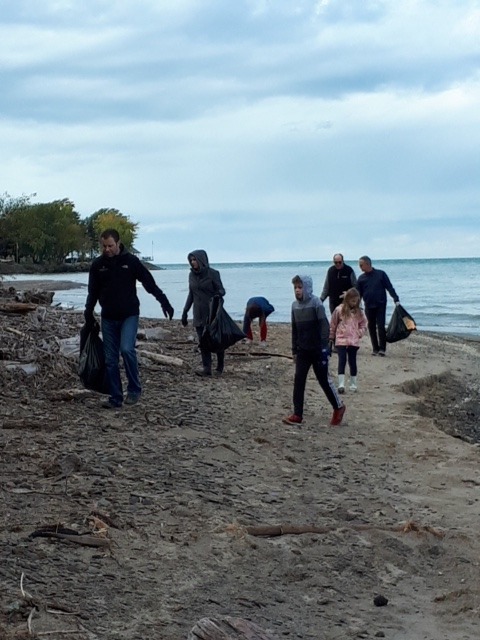 Rotarians, family and friends recently went to work cleaning NOTL beaches. Sadly, it was required work. Rotarians Joe Will and Jason Lalonde and family are hard at work doing good. 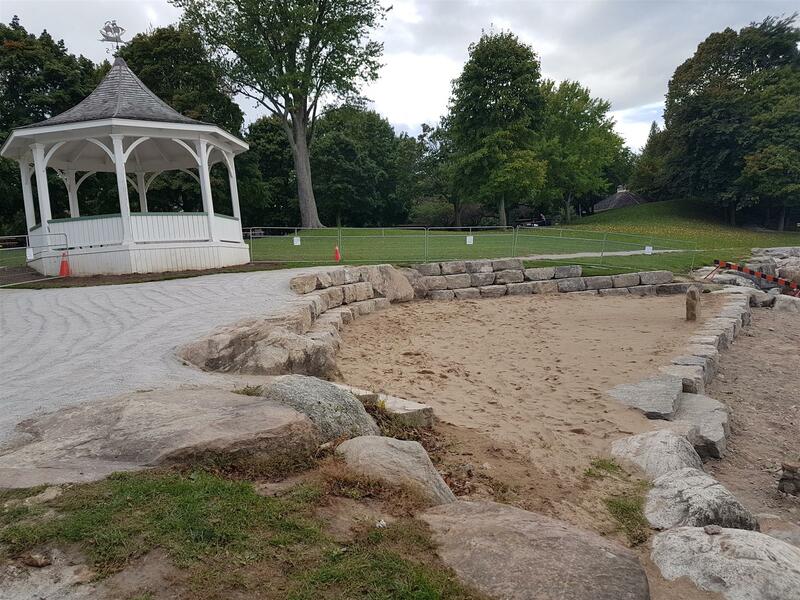 The Rotary Rocks were officially unveiled today by President Nadja Lepere and Paul Lalonde, Chair of the Community Service Community. 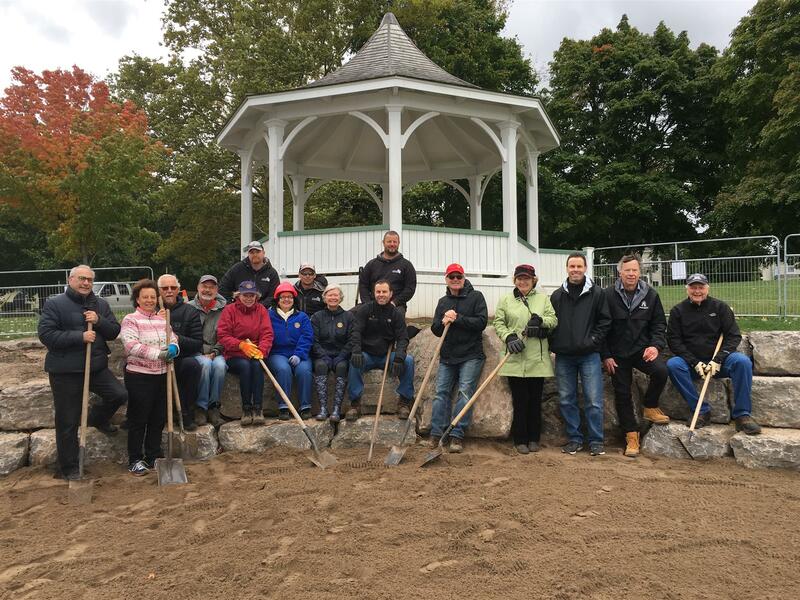 Seated on the new rock amphitheater are Members of the Rotary Club of NOTL, representatives of the Town of NOTL and our partner in the project Roxburgh Construction. We're delighted to welcome eight new Honourary Members to our Club. Honourary Memberships were awarded to several retired Rotarians (Dave Bergen, Ruth deLaat, Sali MacDonald, Franco Olivieri, Petra Browning and Bill Francombe) who were long serving members of our Club and made signification contributions throughout their Rotary career. Community members Connie Haddow and Rose Campbell were recognized for their strong, ongoing contributions to the Club's programs and fundraising events. We're honoured to have them as members of the Club and thank them for all their support and contributions over the years. On Sat Oct 20th Rotarians provide a pick up service for community donations to Newark Neighbours. 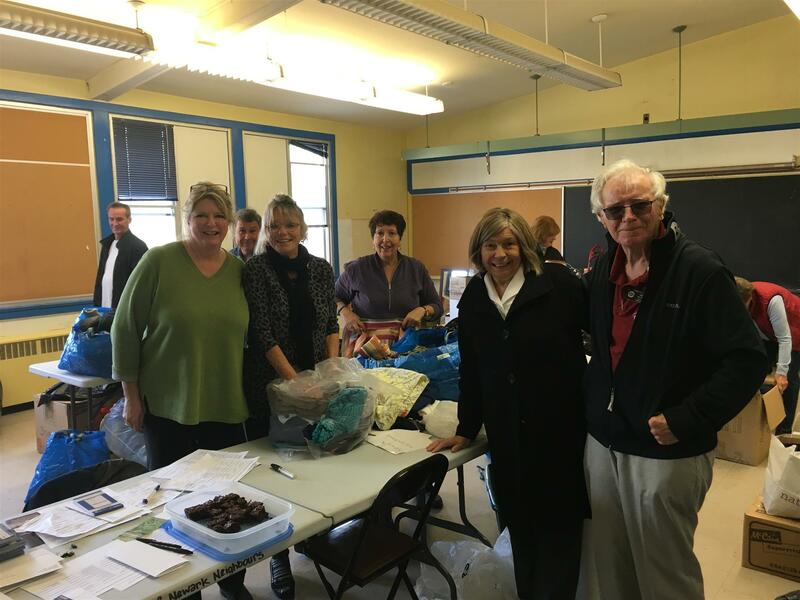 It was a great opportunity for residents to declutter and re-organize and as a result, a very successful day for Newark Neighbours. Thank you to Newark Neighbours for their caring support of our less fortunate community members. President Nadja Lepere welcomes District Governor Melisa Schrock and Rotary International President Barry Rassin to the 2018 District Conference at the NOTL Community Centre. It looks GREAT! A few final touches and it's good to go. Thanks to Paul Lalonde and the Community Service Committee for spearheading this project. It's a great addition to our community and will be enjoyed by the Town's resident and guests for many years to come. Rotary Icewine Cocktail Party - A Winner!! Recently, the Rotary Club of Niagara-on-the-Lake hosted the Icewine Cocktail Fundraiser in the lovely home of Dawn Barnes and Pierre Jean Jerome. The event was, again, a huge success raising over $20000 which was shared equally between Wellspring Niagara and ShelterBox Canada. Nadja Lepere, President of Niagara-on-the-Lake Rotary, describes the evening as “a great night supporting two deserving causes”. Guests enjoyed canapés donated by the best restaurants in the area, beer courtesy of a local micro brewery and wines donated by Niagara’s finest wineries. Icewine martinis, always a hit, were available from two specialty bars. The night has proven to be a gathering point for friends and an opportunity to make new friends. The Icewine Cocktail Party is now an annual event and on the ‘must attend’ list for many in town. Throughout the year, the local Rotary Club provides great entertainment value at their fundraising events in support of Rotary projects. Geoff Lloyd of ShelterBox Canada receives a $10,000 donation cheque from Nadja Lepere. Got stuff? We'll pick up your donations to Newark Neighbours Sat Oct 20th. Contact newarkneighbours1@gmail.com to arrange the time. 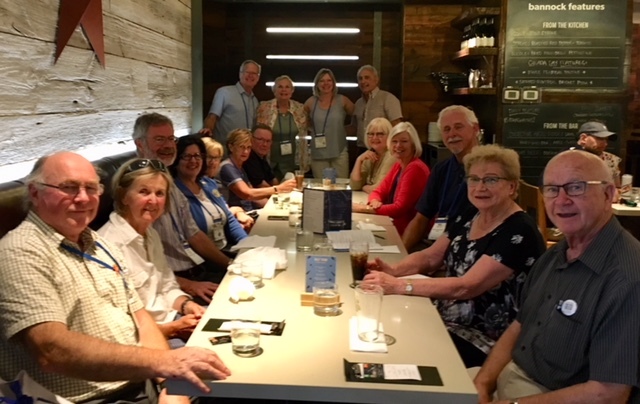 The Rotary Club of NOTL is well represented at the Rotary International Conference in Toronto. We took time out from serious conference work to enjoy good food, good times and good friends. On Tuesday, April 24th, the Rotary Club of NOTL awarded Paul Harris Fellowship Awards to three individuals for their outstanding contributions to the community. This year's award winners were Darrell Boer, Yolanda Henry and Peter Manning. Darrell Boer of Regal Florist, has donated both his time and resources in supporting the Rotary Holiday House tour since its inception nineteen years ago. Darrell is a member of the Covenant Christian Reform Church where he is a Deacon and Chairman of the Outreach Program. He has also contributed to numerous local and international charities. Yolanda Henry is a longtime supporter of Tabitha Canada and is presently Chairperson of the Tabitha Foundation Canada. During her time, donations have totalled over $1.5 million dollars to support many programs in Cambodia (including the construction of two schools, hundreds of homes and thousands of wells). Yolanda has also organized seven hands on building trips to build homes in impoverished areas. Peter Manning has been a Rotarian for fourteen years and has served as a long-time Treasurer for two Clubs. Peter has also served on the Holiday House Tour Committee and as Chair of the Canada Day Committee. Peter is a kind and giving individual who exemplifies the values of Rotary. Dave Haddow, VP Membership welcomes new Members Paul Battaglia and Jamie Knight to the Club. Pictured from left to right, Rotarian Pamela Wilson, Chase Brunton, Michaela Overweg, and Ashley Rowe. Outstanding Rotarian Howie Kudlats 'prepares' for happy dollars. Looking good Howie! Nadja Lepere and Bill French present Clair Ellsworth with a $6,000 cheque to help fund a new Sensory Room at Red Roof Retreat. 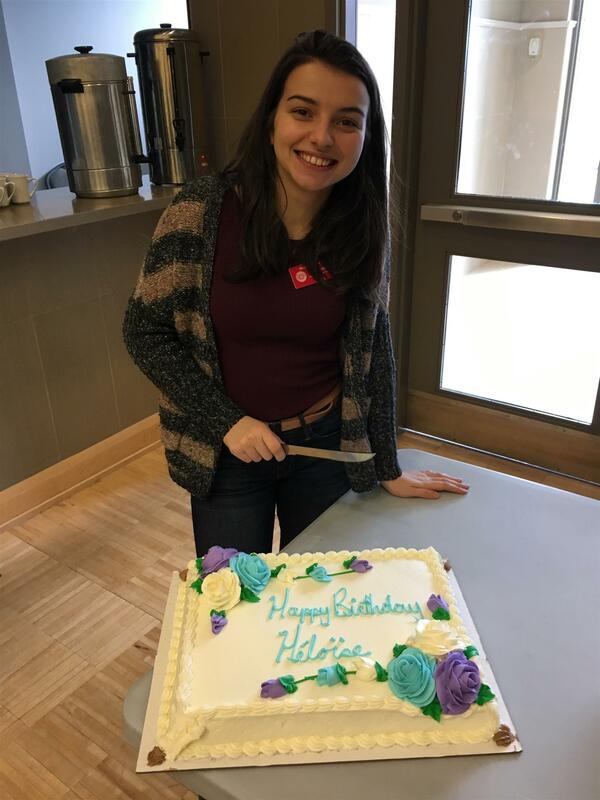 Our exchange student from France celebrated her 18th birthday with us. Bon anniversaire Heloise! All the best. An interesting and informative presentation from Mayram Traub, Superintendent, Niagara EMS. When we need it most, we're in good hands. Thank you Martin for your ongoing support of the Rotary Foundation and all it's good works. Well done Big Guy. A new Paul Harris Award recipent! Congratulations to our petit, wonderful Rotarian Nicole Goodwin! Thank you for your generosity and your support of the Rotary Foundations good works worldwide. Your donation makes a difference to those who need our help most. More than 90 percent of donations go directly to supporting over 33,000 Rotary service projects around the world. Thank you to Club Members and friends of Rotary who donated over $5,000 to the NOTL Rotary End Polio Now event. With matching grants from the Canadian Government and the Bill and Melinda Gates Foundation the Rotary International End Polio Now campaign will receive over $45,000! We are close to eradicating Polio but we need to stay the course ( a minimum of 3 years and $1.5B US) to ensure that there 0 cases worldwide. Thank you for your generous contributions. 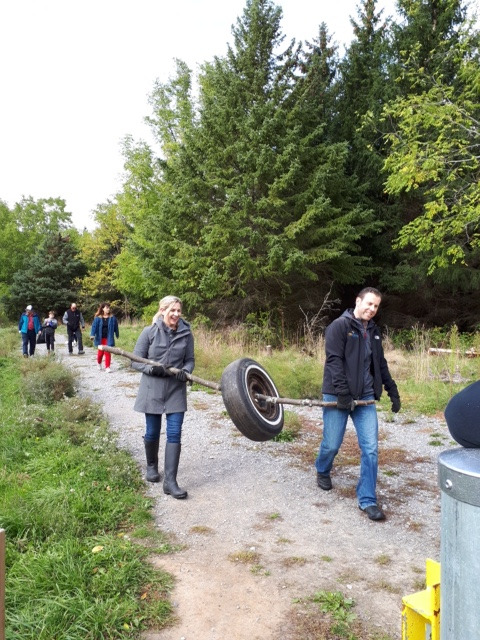 We had a great visit to the Niagara Region Native Centre where we toured the facilities and had a presentation on the Centre's Mission and programs by Executive Director Mitch Baird. We also enjoyed a wonderful lunch which was catered by the Centre. Thanks to MItch and his team for an informative and enjoyable event. To search our story archive, click here. The Rotary club of Niagara-on-the Lake was initiated by Dieter Janus, Jim Alexander, Norm Fraser and Ranjit Ahluwalia in the fall of 1993, and meetings were held downstairs at the Prince of Wales Hotel. With the noon hour Rotary club in Niagara Falls as our sponsor, and 26 active members, it became a chartered Rotary club in the spring of 1994, at a reception at the Queens Landing Hotel. 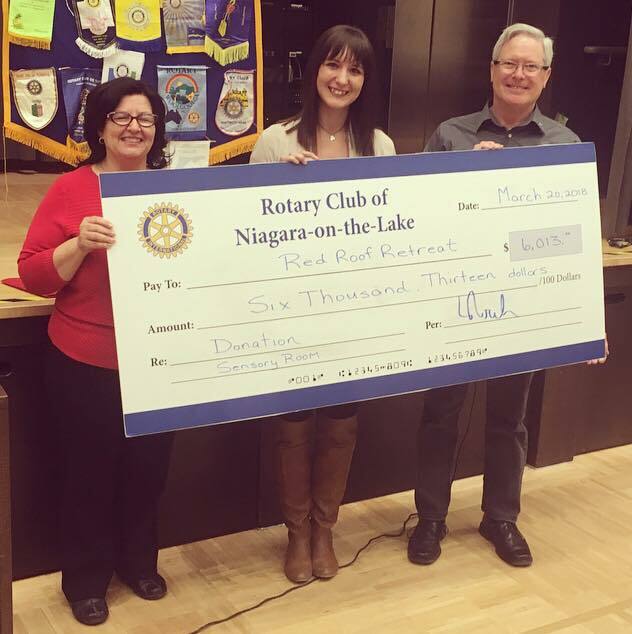 The Rotary Club of Niagara-on-the-Lake was immediately active with fundraising for local and international projects. Some of these early fundraising events were held in partnership with the Theatre Beyond Words and involved renting the main theatre at the Shaw Festival for concerts and productions. The $5000 Gift of Life donation, which brought children from third-world countries to North America for heart surgery, was the earliest program which the club undertook and is still supporting today. The club also supported the Easter Seal Program which helped local children with physical disabilities. This has grown over the years, in conjunction with Steffanie Bjorgan, into what is now Red Roof Retreat. The Youth Exchange Program was actively embraced by the club in 1996. Over the years, exchange students from all over the world have been hosted in the homes of local Rotarians. In the late 1990s, our club organized the shipment of over $250,000 of used medical and computer equipment to the Caribbean. This tradition of offering help to third world countries continues today with the donation of funds to projects in Africa and Central America. Our club has grown to over fifty members. 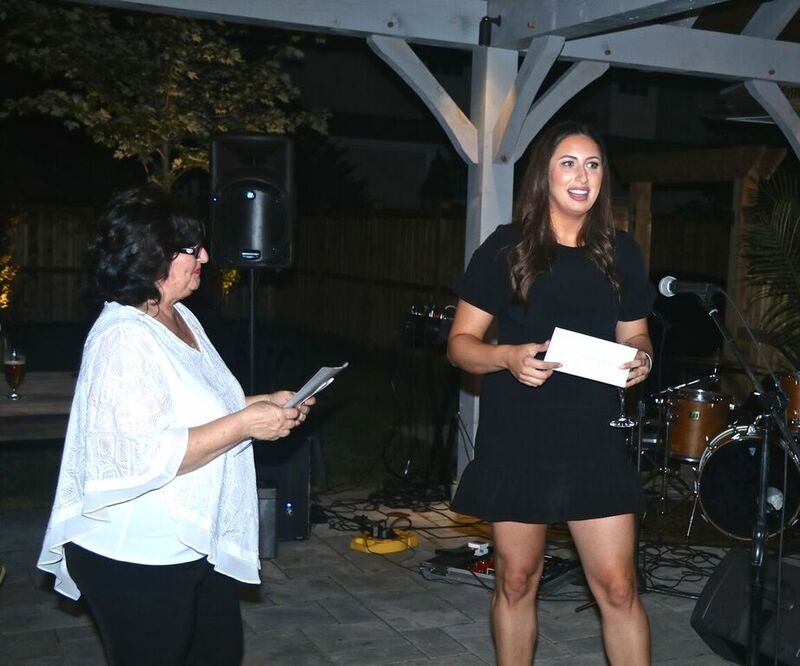 This growth has meant that, along with the help of the community it can undertake large scale fundraisers such as the Holiday House Tour, the Icewine Cocktail party and the Fashion Show.